Traveling can be called a passion of millions of people all over the world. Each journey takes its particular place in the heart of each person who travels. Majestic buildings, remarkable architecture, outstanding old streets – all of these places can be saved not only in your heart and soul. They can be shared with people who adore traveling as much as you do. For this very reason, we want to grab your attention by means of this wonderful article. 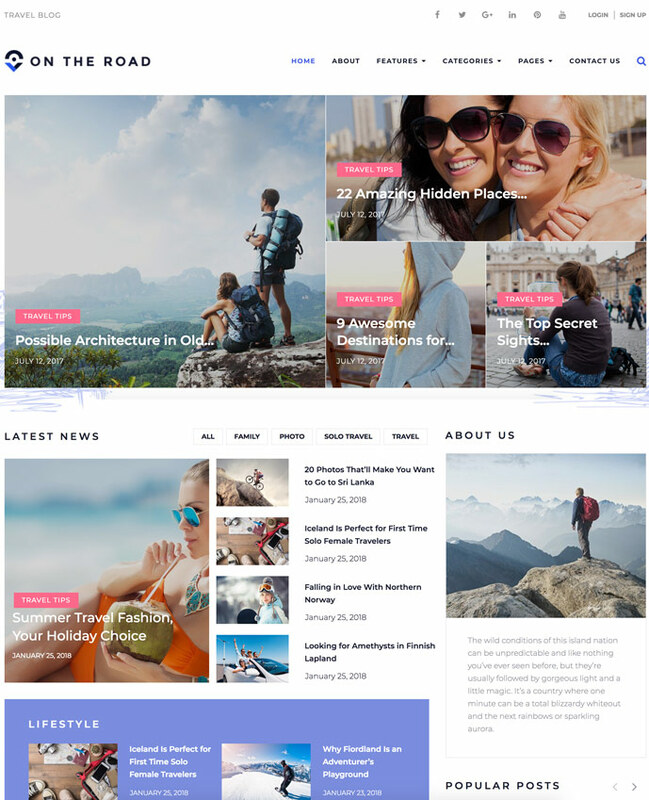 It includes 15 traveling WordPress themes that will impress your imagination with color and expressiveness. If you want to help people, who cannot decide which place of interest, find their perfect country or city, it’s time to create a travel blog. Yet, to begin with, we need to explain to you what are the reasons to opt for WordPress. WordPress is an open-source and free platform. Some additional money for using, installing, or downloading? Forget about it. It’s possible to create a website of any complexity together with WordPress. Blogs, business websites, online-stores, and other types of online-projects – all of them can be built by means of this platform. It’s a SEO-friendly platform that Google really loves. Moreover, you can use some additional plugins to be ranked even higher in search results. There are a plenty of WordPress themes available on the Internet. WordPress is a flexible and user-friendly platform that doesn’t require any expert skills of coding from you. In order to present your travel memories at their best, you just need to pay your attention to this template. Travellino is an eye-catching theme that will allow you to describe your journeys to every corner of the world. A vibrant design will remind everyone of various emotions that they felt during their trips. 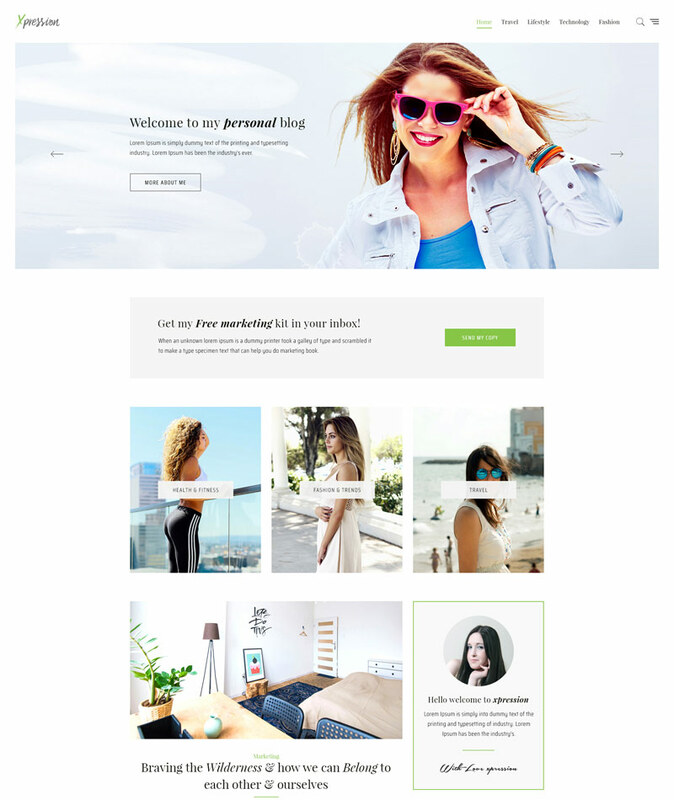 With the help of the amazing Elementor Builder that includes a bunch of robust widgets, you will be able to build a tailor-made look of your blog. This means that you don’t need to have expert coding skills to build a professionally-looking website. You can also divide your information into various categories thanks to a fully-fledged mega-menu extension. Furthermore, four blog layouts will make it possible to distinguish your blog from others. Meanwhile, different footer variations will assist you in creating a unique appearance of your future blog. By the way, a wide range of plugins will easily enhance the functionality of your website. 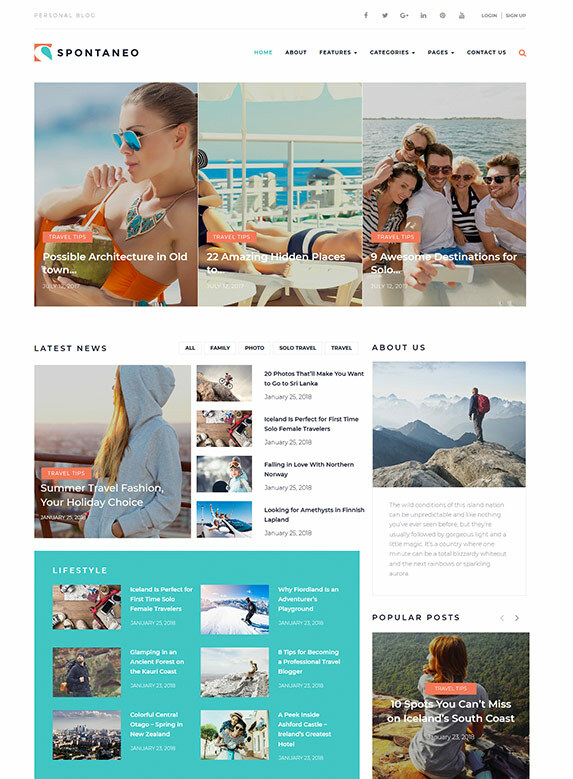 This wonderful theme will assist you in launching a top-notch travel blog. What amazing features will you get alongside with this bright template? To start a with, a tailor-made design. A clutter-free layout will focus the attention of your readers on the content and make it look very exciting. In order to add your information to a website, just make use of the excellent drag-and-drop builder. It won’t require any coding skills from your because it will gladden you with a user-friendly content building. Together with a wide range of stylish and impressive additional pages, you will be able to describe your passion for traveling in the tiniest details. You can easily brighten your website up by means of four blog layouts. In addition to this, multiple header variations and bonus images will allow you to gain more and more new readers every single day. Thanks to a great Cherry Search, everyone will be able to find what they are looking for in a flash. In such a way, people will get familiar with your travel blog and its articles extremely quickly. 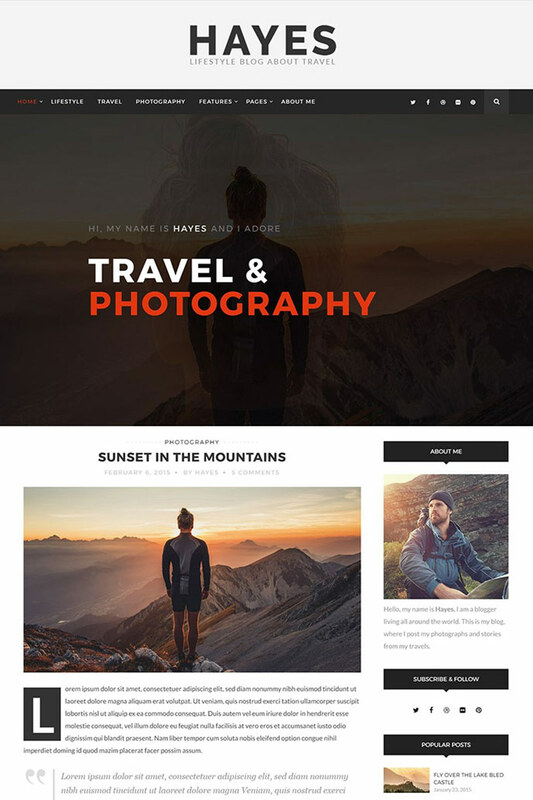 Travelop is an attractive theme that will capture the attention of every person interested in traveling. There are a wide variety of functional tools that will capture your attention. Let’s get familiar with the most crucial ones right now. There is no need to make a plenty of efforts to build a great website – just take advantage of the perfect WordPress Live Customizer. By means of it, you won’t stuck at coding because it allows tweaking colors, layouts, and fonts in a user-friendly way. If you want to promote your travel blog all over the Internet, you will get a chance to do it. For example, you will get a powerful Facebook like-box, Twitter feed, and Instagram board that will catch the eye of people who consider themselves to be fans of social networks. In order to make your website look even more stylish, pay your attention to a huge collection of Google Fonts. Thanks to them, it will take you completely nothing to convey your main message with the help of the impressive typography. Finally, you will get six amazing post formats. Among of them, you can find the following ones – standard, gallery, image, video, quote, and audio. An exciting template that will focus the attention of your readers on your thrilling posts. What are these very functions that will captivate each visitor of your travel blog? To begin with, you will get a stunning Elementor Builder. Its complete pack of widgets will assist you in creating the most eye-catching website ever. Together with this outstanding theme, you will also get a lot of robust plugins that will enhance the functionality of your blog. By the way, this package also includes a wide range of Cherry Plugins that will make it possible to present various aspect of your journeys. In addition to this, you will be impressed with four blog layouts that will distinguish your website from others. You can easily divide your information into different categories and sub-categories. In this case, you just need to take advantage of the amazing mega-menu that will guide your readers through your blog. Finally, different footer styles will create a unique look of your website without any particular difficulties. 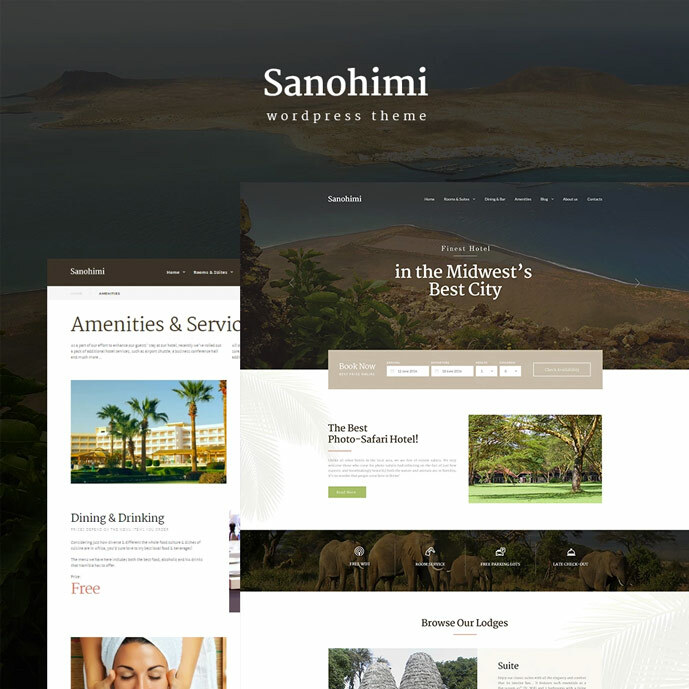 An attractive theme that comes pre-loaded with various tools that will transform your website into a wonderful discovery. Actually, it includes all essential features to launch a powerful travel blog. 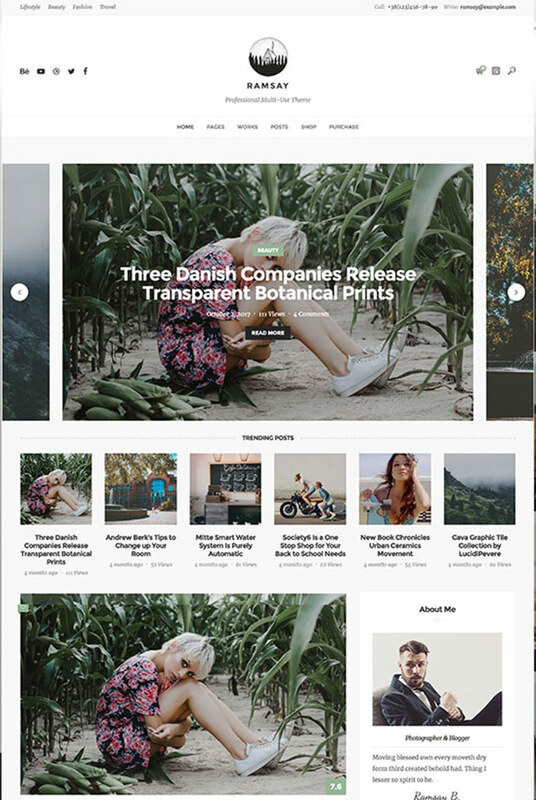 A minimalist design of this template won’t allow people to pass by your blog and miss your exciting articles. Its modern typography will not definitely leave your potential readers indifferent. Each creative will look through your travel blog in order to find out more about it. By means of the marvelous WordPress Live Customizer, you will be able to build a website without coding. Moreover, you can view all changes in fonts, colors, and layouts without reloading your pages. Make use of different types of the portfolio to showcase your traveling stories in the best possible light. Multiple kinds of the page will allow you to impress people with your captivating stories without any troubles. By the way, you will get various types of the post that also can be called a very important part of this package. An impressive template designed for women who consider traveling to be their passion. If you’re dreaming of the feminine design for your future travel blog, this incredible solution should certainly catch your eye. To start with, you will get multiple footer styles that will allow your website to stand out from the crowd of others. What about different Cherry plugins layouts, they will make it possible to create an out-of-the-ordinary website. In addition to this, you will be glad to use a bunch of outstanding plugins. They will make your website more functionally-rich and powerful. It will be also possible to guide your readers through your blog. A wonderful mega-menu has the power to create different categories and subcategories. It will make it easier for people to find the needed information. Don’t forget about a feature-rich Elementor builder to build your content in a flash. 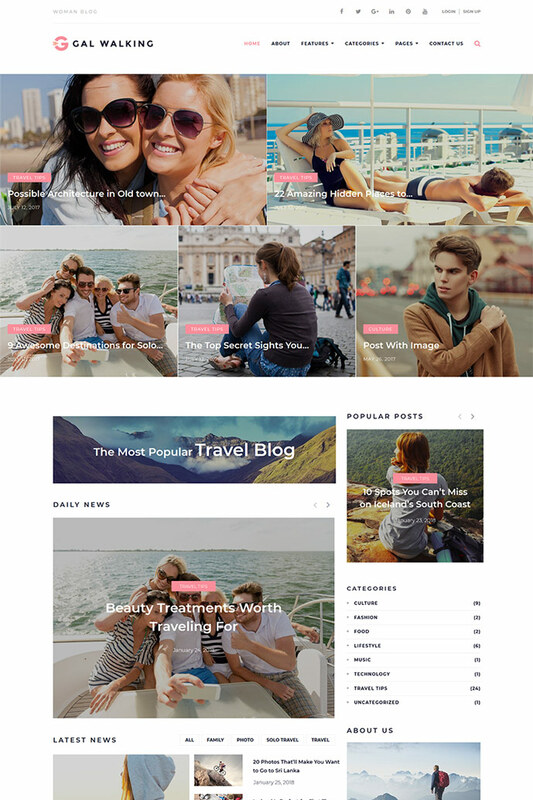 Hayes is a fascinating theme that will make every possible traveling fan fall in love with your blog. It comes together with a good-looking design and perfect functionality. A modern layout won’t leave your core audience indifferent and make them become interested in your post. With the help of six homepage styles, you will be able to choose the most eye-catching one that will convey your message at its best. Furthermore, you will be impressed with a great Revolution Slider that will provide you with a chance to present your content in an out-of-the-ordinary way. 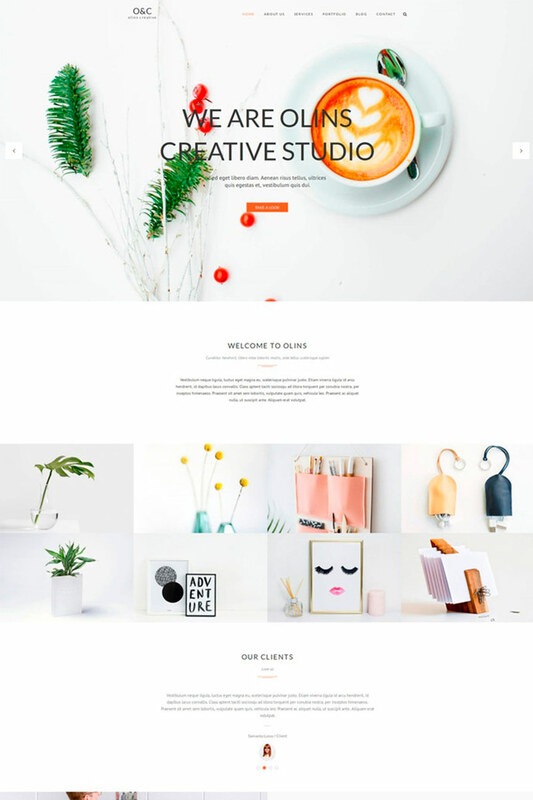 In order to let you create a tailor-made design, you can also make use of three blog types and six gallery styles. You will also get unlimited color presets and Google Fonts that will make your blog look even more impressive. This template is integrated with top social media networks. Thanks to different social buttons and widgets, people will be able to share your articles on their social profiles. If you want to present your traveling memories in an out-of-the-ordinary way, you should set your eyes on this marvelous template. Its unusual design is definitely impossible to leave unnoticed. What is more, it comes alongside with multiple tools that will brighten your blog up. So, let’s take a look at the most important features included in this package. With the help of the feature-rich WordPress Live Customizer, you will be able to view any changes you make in your design in a real-time mode. All modifications in layouts, colors, fonts, and other elements will be shown on the screen immediately. No coding required – just a simple and pleasant process of website building. 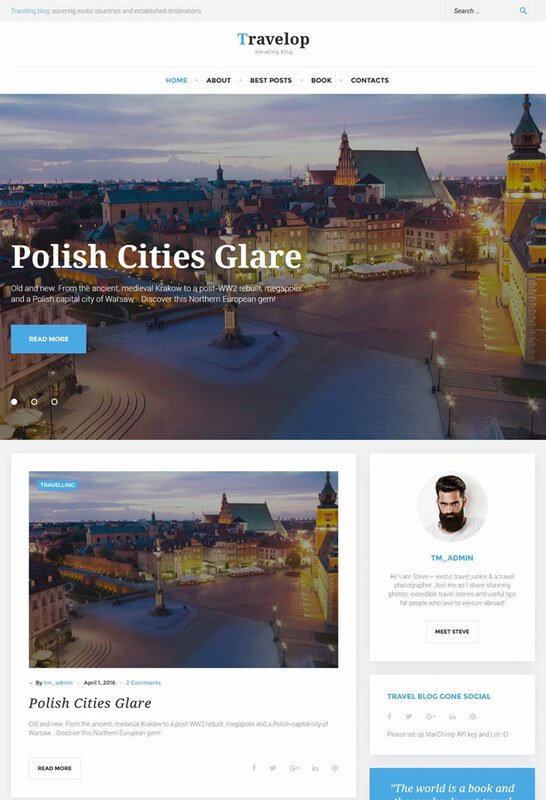 This template will also offer you a wide range of header, footer, and sidebar styles. If you mix them, you will certainly get a website that will become an extremely attractive one for your target audience. What about a bunch of Google Fonts, they will allow you to make your blog look more modern. One more minimalist solution that will impress your imagination. Its unusual and eye-catching design that will make it possible for your readers not to take their eyes off your blog. Yet it will also catch your eye with its wonderful functions that are already waiting to enrich your website. Thanks to a fully-functional Revolution Slider, it will take you nothing to catch the eye of your core audience. You will be able to create stunning sliders to present your posts in a brand new way. In such a way, everyone will be captivated by your posts. You will also get a theme color switcher that will allow you to make your website look brighter. By the way, you can enjoy a seamless customization process. It becomes possible thanks to a fully-functional visual builder. In such a way, you will work in a what-you-see-is-what-you-get way of building your content. An outstanding template that will grab the attention of your target audience. No, it’s even more than that. Everyone will certainly forget about all other travel blogs. A content-oriented design will allow them to focus on your information and become excited about your brand new articles. 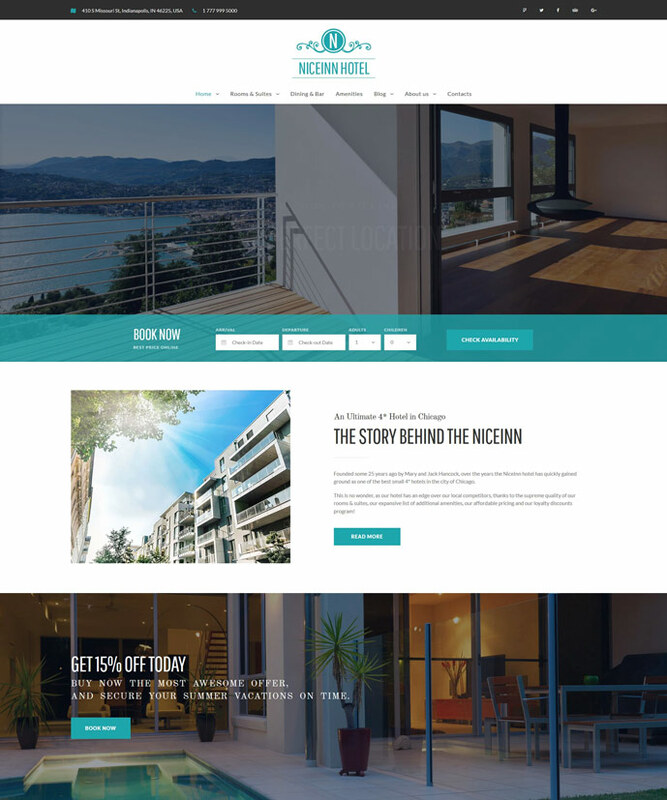 In addition to this, you can also take advantage of such option as multiple homepage layouts. They will allow you to select the most attractive solution to present your articles in the best possible light. In order to make your posts look fresher, pay your attention to various gallery and blog types. Amon gallery variations, you can use the following ones – two types of the full-width gallery, two types of the boxed gallery, Instagram feed gallery, video gallery. If you want to get a completely impressive appearance of your future online-project, just take advantage of stunning Google Fonts and unlimited color options. 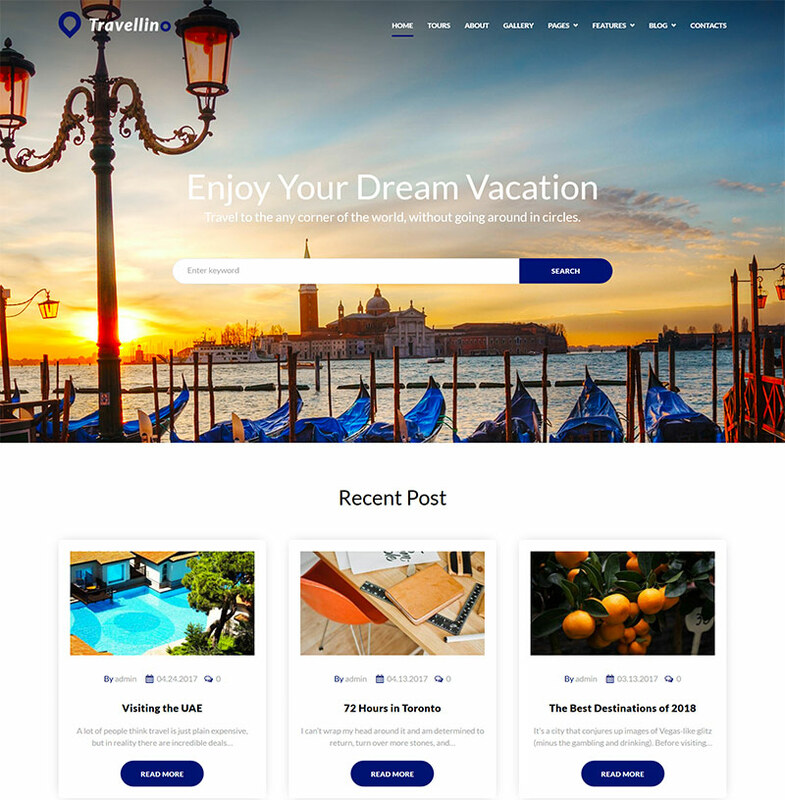 It will take you completely nothing to present your high-quality traveling photos because you will get a full-width page with a slideshow and a sidebar page with a slideshow. If you have a passion for visiting some exotic countries, you should certainly set your eyes on this theme. It will easily allow you to tell people about your trips. First of all, you need to take a glance at the wonderful drag-and-drop builder. It will provide you with the opportunity to build your pages without any knowledge of coding. A great collection of Cherry Plugins looks like a perfect chance to enhance the functionality of your website. Thanks to them, you can easily present your projects, build a user-friendly search, and catch everyone’s attention with pop-ups. In order to add different types of content to your pages, you should make use of content modules. In such a way, it will take you nothing to add slider, web forms, images, buttons, and other elements to your blog. Furthermore, you will get various additional images to impress your readers with an unmatched brightness. Don’t forget about an incredible TM Gallery that will showcase them in the best possible light. Present your memorable traveling stories by means of this remarkable template. Its outstanding design will do everything in its power to attract a lot of new readers to your blog. Take advantage of multiple layout options that will make it possible to experiment with your pages and their structure. You can also save the most well-favored layouts in the built-in library in order to use them later. Moreover, you cannot pass by multiple custom widget. For example, you will get such important widgets as a post carousel, slider, and social widgets. They will allow you both to promote and present your information in a stylish way. With the help of multiple content modules, it will be easier to add your content to a website. You can add images, sliders, contact forms, buttons, and so and so forth. All of them have an extended set of functions to work with. Are looking for a vibrant solution to present your memories about visiting various countries? In this case, you should definitely pay your attention to this template. It has a wonderful design that will make other people think about their old journeys that warm their hearts. To cut a long story short, this template includes a plenty of robust features. For example, everyone will be impressed with a wonderful Cherry Search. It will provide them the opportunity to find the information on the chosen topics. You will also get different layout variations that will make it possible to build different pages with different structures. Meanwhile, a plenty of content modules will assist you in adding your information to a blog. Don’t forget about a marvelous TM Gallery that also includes various helpful features. In general, all of its features will allow you to build good-looking and attractive galleries. 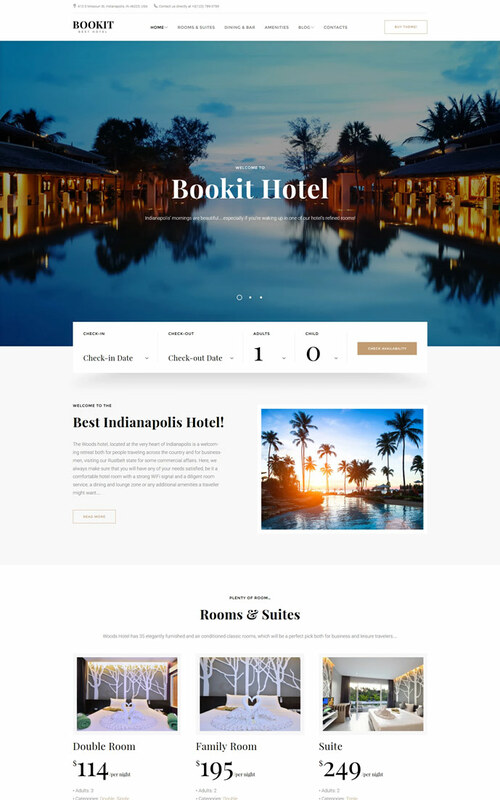 A bright template that has the power to turn your travel blog into one of the most popular websites among fans of journeys. A fully-fledged website slider will assist you in presenting your information in the most stylish way ever. By means of it, you will get a wonderful chance to create custom sliders with some important content, new posts, and any other things you want to highlight. With the help of various social options, it will take you completely nothing to promote your blog on different social platforms and gain new readers. By the way, everyone, who reads your blog, will be able to leave some feedback using a powerful commenting system. In addition to this, a sortable gallery will allow you to showcase your high-quality pictures at their best. A great drop-down menu will add a special interest to your blog. Meanwhile, you can easily implement modern Google Fonts on your website and thus, make it look brighter. If you want to impress your target audience even more, we have a right solution for you. Just take advantage of the video and audio integration to post more about your trips. 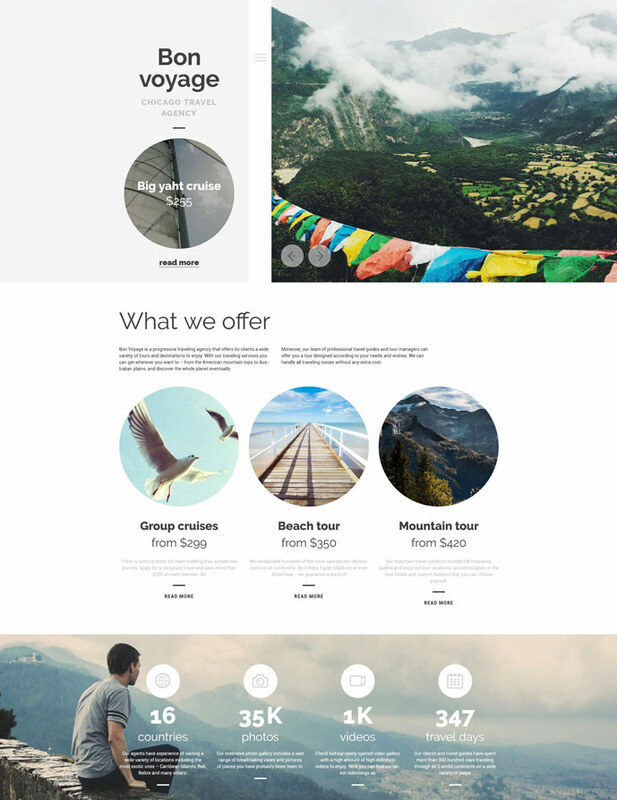 An impressive template that will unleash the potential of your travel blog on the Internet. 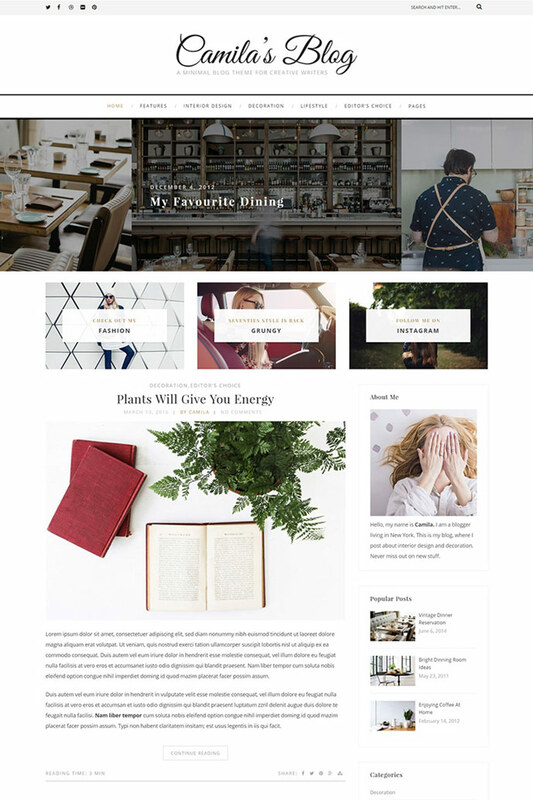 In general, you will get three blog layouts to choose from. Believe us, you can be sure that they will refresh the look of your online-project. Don’t forget about the opportunity to make changes in your design without coding. It becomes completely possible thanks to a wonderful WordPress Live Customizer. You can easily tweak your fonts, colors, layouts, and other element of your blog and see all modification on the screen in a flash. Moreover, you may need to present different types of content on your blog. For this reason, this template comes together with four blog types (a standard post, gallery post, video post, and audio post). In order to make it possible to create a unique look of your website, pay your attention to unlimited number of color schemes. Don’t forget about a chance to promote your blog thanks to an Instagram feed integration. Allow users to become a part of your online-journeys all over the world. Just take advantage of one of these bold and remarkable themes to catch their attention and get your loyal readers. We wish more exciting trips and thanks for reading!